This trek is not currently schedule, but please contact us if you are interested in future scheduled or custom Dhaulagiri treks. 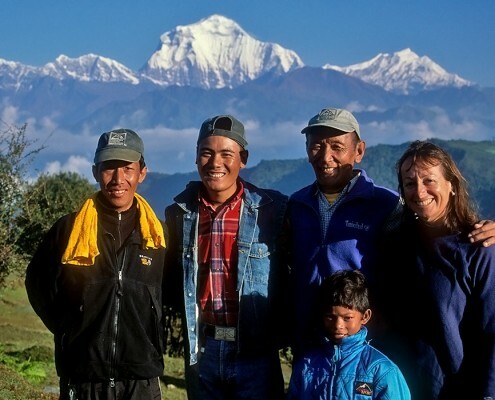 Rick & Celia have explored almost every valley and mountain region of the Nepal Himal during their 30 trips to Nepal. 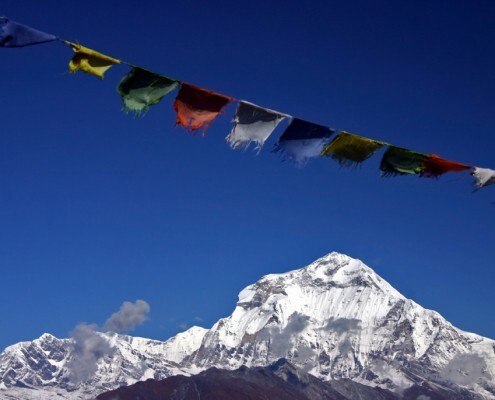 One area they haven’t explored yet is the classic Dhaulagiri Circuit. This 24 day trek starts in the rhododendron forests of the Annapurna region and ends on the glacier and base camp of Dhaulagiri. After base camp we will cross the French Pass and descend steeply to the town of Marpha on the Kali Gandaki River. From here we will travel north to the airport in Jomsom. If we have an extra day we can take a side trip to the famous town of Muktinath. This trip is not for beginner hikers. 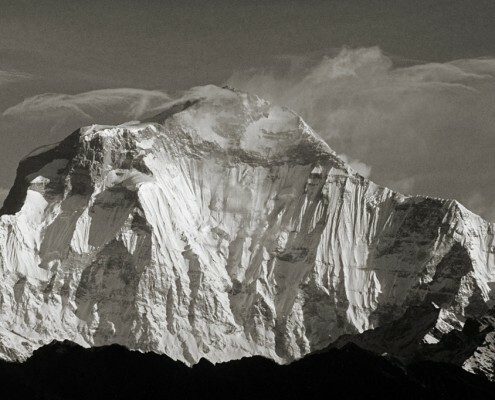 Our expedition will tent camp since the modern tea houses of the Annapurna Circuit or Khumbu don’t exist here! Narrow trails and altitudes up to 5,360m (17,700’ make this a challenging experience for even the seasoned hiker. After a five day approach to the 10,000’ level we will slow down for acclimatization, adding rest days and shortened days as the hills get steeper. We plan to spend extra time in the base camp area (French, Swiss French and American) to take full advantage of the spectacular photography opportunities. A couple of shopping days in Kathmandu will complete this unusual trek. Note: Rick and Celia have used the same Sherpa family since 1986. Our cooks are great at foods we like such as pizza, salads and of course their local specialties. All of our drinking water is boiled and our staff knows how to properly clean our dishes with boiling water to keep us healthy so that we can enjoy our trek.